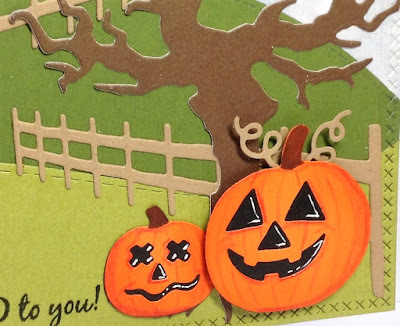 Dies R Us: A Special "Boo" To You! Hello Dies R Us friends~ Birgit here with you today with a not so spooky Halloween card. There are so many fun fall dies at the Dies R Us online store it's hard to choose which ones go in the cart when I really want them all! For this card, I started by creating the background using some various landscape dies, cutting the hills out of two different shades of green. The sky is a piece of printed scrapbook paper. It made the perfect sky, don't you think? Once the layers were in place I cut the whole panel using the largest Lawn Fawn's Large Cross Stitched Rectangles. I love using this die when I don't want a border around the main panel. It cuts the size perfectly to fit an A2 sized card. I went on to add two of the Country Fences from Impression Obsession. Cheery Lynn's Spooky Tree made the perfect backdrop for these funny little pumpkins from Impression Obsession. I added some detail lines and shading to the pumpkins with colored pencils and a gel pen for their eyes. The little swirly fronds coming off the big guy are from Quickuts. I popped the big guy up using some foam dots to give it some dimension. Today's Tip: Add detail and color to your dies using markers, pencils and gel pens. It really brings your dies to life! This is a very 'friendly' Halloween card Birgit! You have created a wonderful scene. I love the extra detail on the pumpkins using a gel pen - thank you! 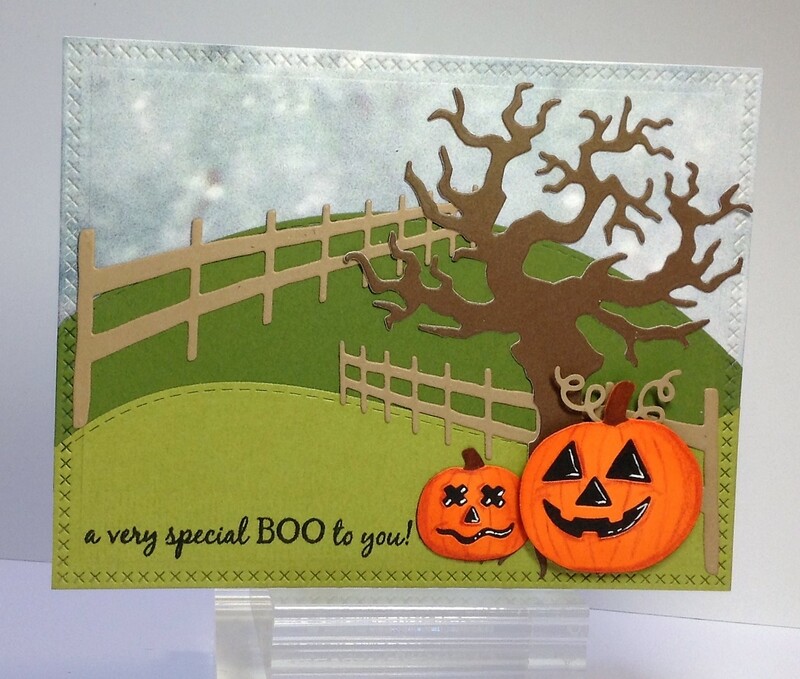 Ooooh loving that Spooky Tree decorated with your fun and scary Jack-O-Lanterns! Your fence dies look great lending depth to your whole scene.....I don't think I could ever place them correctly! lol This is just FUN!!! WOW this is awesome Birgit! The dimension you have achieved in your die cut scene is amazing! Great job! Wonderful inspiration and sure to bring a smile! Terrific scene, I just love how you added the details in for the pumpkins, great job!! 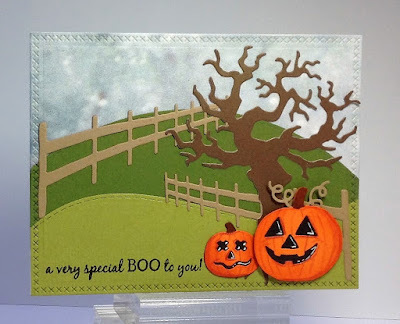 I like the colors you used on this card; they all go great together and give a nice country scene feel to it. Very happy card as you intended it to be. I agree, Birgit! I want them all, too! Your card is OH SO CUTE! I love the pretty use of rolling hills and fences. Those of you who create fabulous scenes - I am SO JEALOUS of your talent and technique! LOL And the sentiment is darling as well. I like the happy jack-o-lanterns!